UBC Library is pleased to announce that applications are now being accepted for the 2014 Innovative Dissemination of Research Award. Established by the Library in 2010, this Award focuses on new and innovative ways of communicating and disseminating knowledge. The recipient will be announced in early 2014 and will receive a framed certificate and $2,000 cash. All UBC faculty, staff and students are eligible. Arlette Farge, The Allure of the Archives (New Haven: Yale University Press, 2013). David Schneiderman, Resisting Economic Globalization: Critical Theory and International Investment Law (Houndmills: Palgrave Macmillan, 2013). Indira Carr, Jahid Bhuiyan, Shawkat Alam, Md Jahid Hossain Bhuiyan, eds., International Trade Law and the WTO (Annandale: The Federation Press, 2013). Kirk N. Lambrecht, Aboriginal Consultation, Environmental Assessment, and Regulatory Review in Canada (Regina: U of R Press, ). Charles L. Howard, The Organizational Ombudsman: Origins, Roles, and Operations: A Legal Guide (Chicago: American Bar Association, 2010). Joel P. Trachtman, The Future International Law Global Government (New York: Cambridge University Press, 2013). Kinesis is now available online! October 21st, 2013 by esquin | Comments Off on Kinesis is now available online! 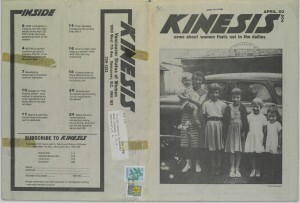 Gender and social justice researchers worldwide –as well as the general public interested in the feminist movement in Canada– will be happy to know of this digital collection that is now freely available online: Kinesis: News about women that is not in the dailies, published by the Vancouver Status of Women (VSW) from 1974 to 2001. This image (the paper’s cover from April 1980) is a good example of what visitors can find in the collection: photographs and articles on issues of particular interest to women and created by feminist voices working to combat all forms of marginalization. This particular issue includes an account of the celebration of that year’s International Women’s Day, interviews with five women on their professional development, and a feature article on the stigma of illegitimacy and the struggle of single mothers to care for their children by themselves. This digital collection is a product of a collaborative initiative with the Vancouver Status of Women, the Humanities and Social Sciences Library, and Rare Books and Special Collections at UBC. Although Kinesis is no longer being published, it has a permanent home for browsing and critical analysis in the UBC Library’s Rare Books and Special Collections division, and now in our digital collections. 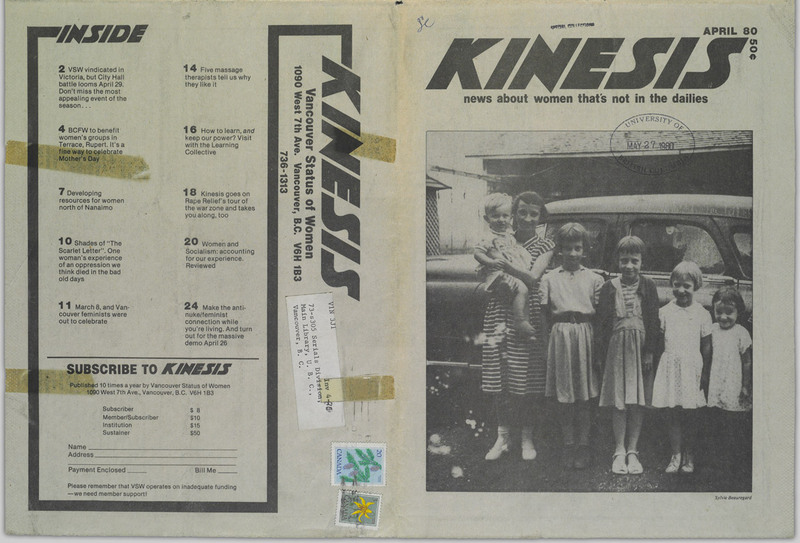 Posted in Digitizers' Blog | Comments Off on Kinesis is now available online!